Newly confirmed HHS Secretary Tom Price likely will spend his first few days focusing on efforts to stabilize the individual health insurance market as Republicans work to repeal and replace the Affordable Care Act. Following the pattern of strictly party-line votes on two previous nominees — Attorney General-designate Sen. Jeff Sessions and Betsy DeVos for Education secretary — the former congressman from Georgia was approved early Friday on a 52-47 vote. Two days earlier, the Senate had voted to move forward Price's nomination on a 51-48 party line cloture vote. Senate Democrats boycotted the nomination, prompting Republicans to suspend the rules and vote on his nomination with no Democrats present. Price has to figure out how to keep insurers in the market for 2018 to avoid a meltdown that could leave 20 million people without coverage. Insurance industry leaders say they need greater certainty about market rules before they decide this spring whether to offer plans and how to price them. Meanwhile, President Donald Trump is counting on the staunchly conservative former orthopedic surgeon to lead the effort to draft an ACA replacement plan, while also taking steps to dismantle the law through administrative measures. HHS already has a draft rule in the works that reportedly responds to insurance industry requests for changes such as greater leeway to charge older consumers higher premiums. Price may be torn between a Trump administration executive order calling for rolling back ACA enforcement and pressure from insurers to preserve rules such as the individual mandate that keeps younger and healthier people in the market. “Decisive action from HHS may be the only thing that can prevent a death spiral in the individual market, and even then, uncertainty about repeal, replace or repair may be too much for HHS to overcome,” said Morgan Tilleman, an associate lawyer with Foley & Lardner LLP in its heath insurance practice. Price will look for President Barack Obama administration regulations that healthcare industry groups have deemed too burdensome and seek to alter or eliminate those, said Dan Mendelson, president of Avalere, a consulting firm. Insurers and hospitals may welcome that. But consumer advocacy groups may not. There also are questions about whether and how Price will promote Medicare's continued shift from fee-for-service to value-based payment models. He has sharply criticized the CMS Innovation Center, particularly its mandatory bundled-payment programs for joint replacements and cardiac care. 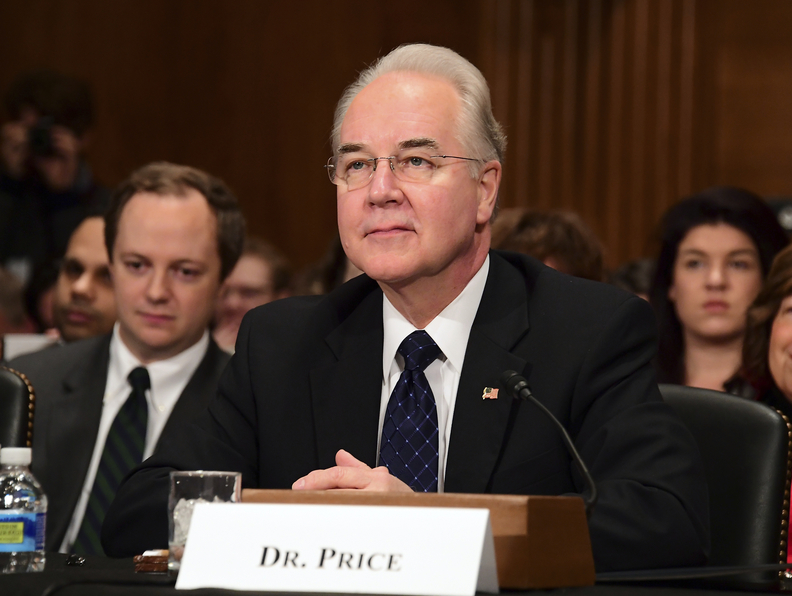 At his confirmation hearing before the Senate Finance Committee last month, Price said the Innovation Center had “gotten off track” and that its mandatory programs were dictating to physicians how they must practice medicine. Under Price, HHS will begin reviewing Medicaid waiver requests from Indiana, Texas, Arizona and other GOP-led states seeking approval for conservative policies that were rejected by the Obama administration, Mendelson said. These states want to impose work-search requirements as a condition for Medicaid eligibility, lock people out of coverage for nonpayment of premiums, and set time limits on how long people can receive benefits. It's expected that Price will look favorably upon such requests, which are strongly opposed by patient advocacy groups. Price is also expected to spearhead the conservative drive in Congress to restructure Medicaid and Medicare, as he previously tried to do as a legislator. Republican lawmakers in Texas, Wisconsin and Price's home state of Georgia want to work with congressional Republicans on proposals to convert Medicaid into a program of federal block grants or per-capita grants, giving states much greater flexibility in how they use federal Medicaid dollars. At the same time, however, states likely would receive significantly less money over time. Price will have a key partner in considering Medicaid waivers if and when the Senate confirms Trump's nominee for CMS Administrator, Seema Verma. Verma has helped such states as Indiana develop conservative Medicaid expansion models. Her confirmation hearing has not yet been scheduled. Verma worked with Vice President Mike Pence on Indiana's conservative Medicaid expansion when he was governor there and consulted on similar initiatives in Iowa, Kentucky, Maine, Ohio and Tennessee. In addition, Price may look for ways to expand the role of private health plans in Medicare, which would be consistent with his support for converting Medicare into a defined-contribution, “premium support” program. He likely will work closely with House Speaker Paul Ryan (R-Wis.) on a proposal to restructure Medicare along those lines and increase the age of eligibility to 67—though Senate Republicans remain leery about making big changes in the politically popular senior health program. Price argues that Medicare restructuring is necessary to protect the financial future of the program. During his confirmation hearing, Price said the Medicare trustees estimate that the Part A hospital trust fund will become insolvent by 2028 unless changes are made. The NAACP, the nation's oldest civil rights organization, had urged the Senate not to confirm Price because of his Medicare views. “Congressman Price is ... a proponent of radical and dangerous proposals to cut billions from Medicare, converting it to a voucher program which would lose value over time and will lead to less parity in coverage and increase the financial burden of health care for low-income groups,” the NAACP said in a letter.